The true Spanish Mustang is a direct descendant of the horses brought to the New World by the early Spaniards. Confused by many with the feral horses currently managed by the Bureau of Land Management there is a vast difference in both appearance and ancestry. Columbus, on order from the Spanish throne, commenced bringing the first Spanish horses to the New World on his second voyage. Thereafter, each ship headed for the New World, by order of the Crown, carried breeding animals of choice Spanish stock. Breeding farms were set up in the Caribbean and subsequently in Mexico. Breeding farms such as the one operated in Sonora, Mexico by Padre Eusebio Kino, a Jesuit priest, produced stock, including horses, which were placed with each group of Christianized Indians as Kino expanded his efforts further and further north. The Apaches, never falling under the spell of the Church, ravaged and pillaged these little "visitas" taking stock at will. They also plundered deep into Mexico allegedly as far as Mexico City. Their goal - well-bred and trained Spanish horses from the Mexican estancias. 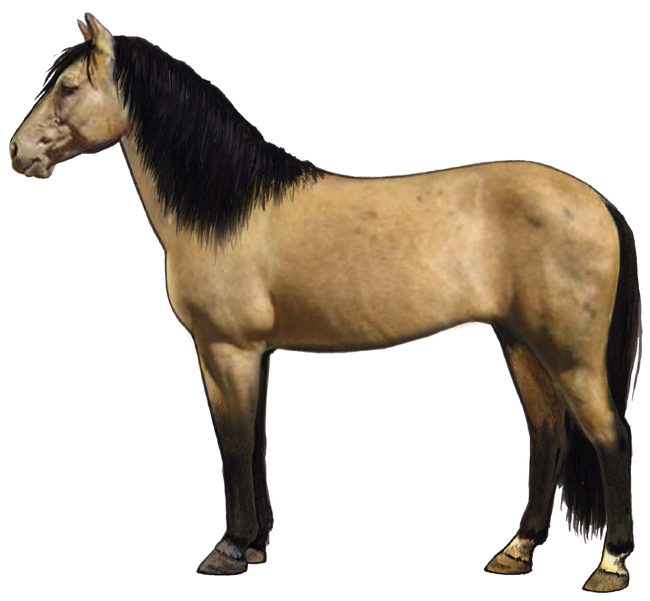 Through trade of these valuable horses northward to other tribes the Apaches became one of the primary methods of spreading the Spanish horses over the west. Over the years horses escaped, were lost or stolen and many became feral, roaming all over the west. Eventually they numbered in the hundreds of thousands, closely related to the horses maintained by some of the Indian tribes, indeed, they were basically the same horses. Considered the finest horses in the known world at the time of the Conquest of the New World, the Spanish horse left a legacy in its tough, beautiful, hardy descendants that endures to this day. On the brink of extinction in the early part of this century, their salvation can be attributed primarily to Robert I. Brislawn of Oshoto, Wyoming, who founded the Spanish Mustang Registry, Inc. in 1957.